Which Students are right for the Bridge Program? The program provides research experiences, advanced coursework, mentoring, and coaching to prepare a graduate school application. The program also partners with doctoral granting institutions to provide transitional support once students begin doctoral studies. We encourage your undergraduate institution to join the Bridge Program as a Member Institution. This free membership is a great way to join a network of academic institutions committed to increasing educational opportunities for underrepresented minority physics students. APS generates statistical reports on issues in graduate physics. These reports are freely available for your use. You may use our graphs in reports and presentations. Credit APS and the data source as shown on each graph. This graph shows the percentage of physics bachelor’s degrees awarded to African Americans and Hispanic Americans over the past decade, with respect to institution type. 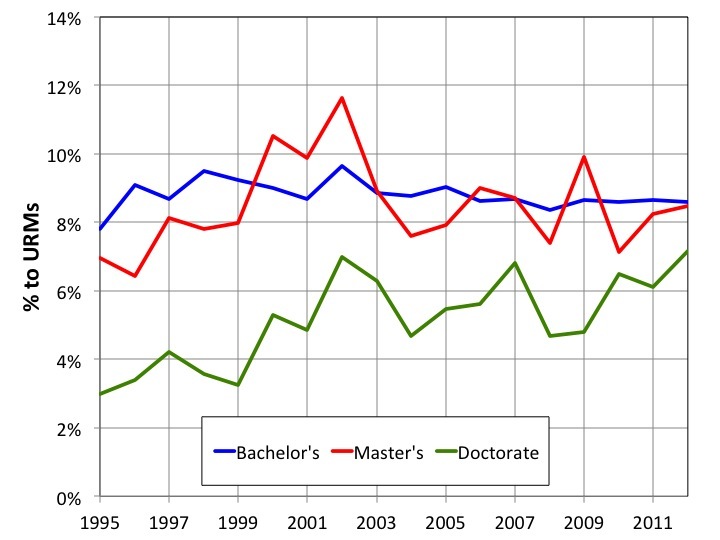 The numbers on the right indicate the actual number of degrees awarded in 2009. This is roughly 10% of degrees awarded to underrepresented minority students. The Bridge Program email list is an easy way to stay informed about events and opportunities concerning increasing diversity in physics graduate education. APS Wavefront is a monthly electronic newsletter for physics education leaders with information about upcoming APS programs, meetings, recent APS actions, and activities within the physics community. All archived webinars are available online. APS regularly hosts workshops and conferences to address critical issues in physics education.